At least 150 people are expected to continue what is now a desert tradition, by dressing up and ringing in 2014 the way New Yorkers do. 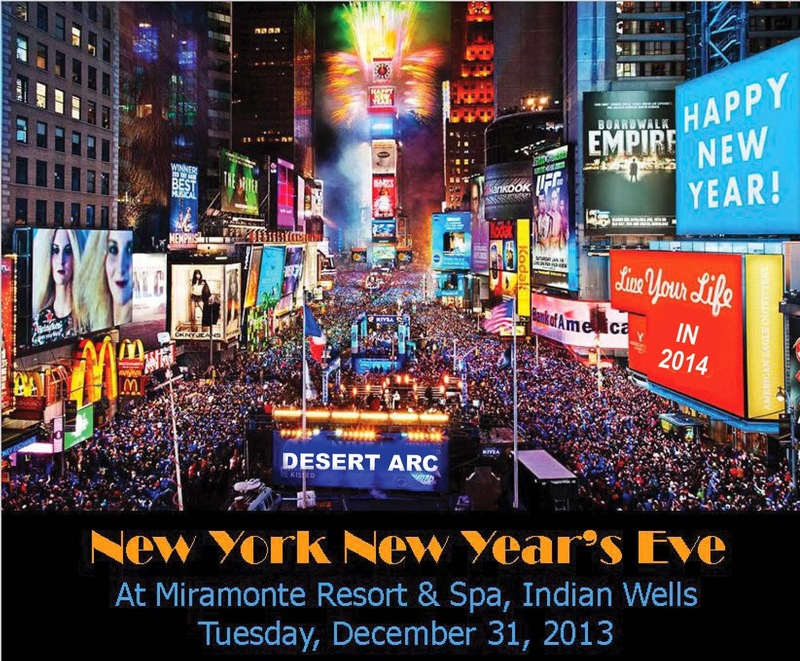 The 2nd annual “New York New Year’s Eve” celebration will be held Tuesday, December 31, 2013 at the Miramonte Resort in Indian Wells, California. Guests will start their evening off with cocktails at 6:00pm followed by an elegant buffet dinner, raffle prize giveaways, music, dancing, and a live, televised “ball drop” from Times Square in New York at 9:00pm accompanied by a champagne toast and party favors. Dancing and dessert will continue until 10:30pm, giving attendees the option to head home and put on their PJ’s or continue on to their next party. This year’s Chair is Loretta Ferraro, well known event planner and wife of Desert Arc CEO Richard Balocco. All proceeds benefit Desert Arc. The mission of Desert Arc is to enhance the quality of life and create opportunities for adult clients with disabilities, 18 and over. Desert Arc serves people with developmental disabilities, including autism, cerebral palsy, epilepsy, mental retardation and other medical conditions. Many have multiple disabilities and nearly all are low income. Currently Desert Arc has 900 clients enrolled in all programs. To make reservations and purchase tickets, please call Desert Arc at 760-346-1611, by December 27, 2013, or email Alison Elsner at alison.aepr@gmail.com. Mitch Blumberg, Deputy Director of Desert Arc, said, “We have so many people attend our party from throughout southern California because it has something for everyone. Not only will there be outstanding gourmet buffet stations, top notch entertainment, and a spirited, warm atmosphere with instant friends, but also we will be raising funds to directly impact the lives of Desert Arc clients by providing meals, transportation, and job training to developmentally disabled adults who are finally given the chance to live independently and contribute to society. The beautiful Miramonte Resort and Spa, nestled into the base of the Santa Rosa Mountains, is located at 45-000 Indian Wells Lane, Indian Wells, CA. 92210. For more information, please visit the Desert Arc website or call 760-346-1611 or email info@desertarc.org.